Julius Cesar would be proud of Western achievements in the Balkans laboratory. Since the end of the 1980’s the peninsula has been fracturing like tempered glass, and every time any economic and political integrative progress is made, the West just bangs its hammer on the ethnic and religious borderlines and the Balkan fractures again. In the epicenter of it all are the countries once constituting the Federation of Yugoslavia and their shift from integrative and modern national identities towards secessional minority interest groups. To understand the methodology of Western political and social engineering we need to look at the US and British involvement in the Balkans, which has been on four levels: policy, grassroot, military and demographic. The West’s insistence on implementing legislative rights for ethnic minorities in a country sharing a border with that minority’s homeland, is clearly a stimulation for further ethnic segregation of the society and federalization of the state. It comes natural for a minority ethnic group to gravitate to a more macrosocial national identity where it shares institutions with a majority ethnic group (infrastructure, government, military, police, health, welfare etc.). If you begin segregating the institutions, you begin secession of national identities. Giving more “human rights” is simply generating social segregation and eventually conflict and civil unrest, in worst case scenario civil war. In the case of Macedonia, where 25% (Census 2002) are ethnic Albanians and 62% are ethnic Macedonians, this pro-minority trend has been taking shape as policy through carrot and stick diplomacy, mainly with promises of UN, WTO, EU and NATO integration (prosperity and safety). Thus in Macedonia it has been a must have tradition for Macedonian political parties to coalition with Albanian political parties. Each side has two parties to vote for and then the government coalition is formed ideally from both winning Macedonian and Albanian parties. Due to foreign strong arm diplomacy on policy level for the past 25 years, Macedonia cannot even imagine having a ruling coalition or a single party government without Albanians. Even when the Macedonian party has sufficient majority to constitute a government on its own, it decides to coalition with one Albanian party and avoid diplomatic and media pressure. If the principle was maintained, everyone got a good pat on the back and lots of promises for a European future and NATO ally benefits. Macedonia was multiethnic island of peace and prosperity in the midst if the fiery war enraged Balkan region. The notorious philantrhropist George Soros names his foundations as Open Society Institutes (Karl Popper is spinning in his grave) and their involvement in countries throughout the world is with one clear goal: disabling the natural mechanisms of majority groups for self-preservation. This takes the form as meddling into immigration regulative and quotas, lobbying against implementing singular official language and toponyms, labelling all integration of traditions and values in institutions as unevolved and suppressive tyranny over minorities, write White Reports, organize protests and lobby for affirmative action benefiting ethnic, cultural and religious minority groups in the state institutions. Everything is covered with thick paint called “human rights”. The biggest victim to this network of NGOs is the Macedonian youth which is indoctrinated with Western neoliberalism, bleached from any national pride and identity, expected to become a faceless consumer who lives on airports, has no family, no friends and his/her career is money, whatever form it takes to generate it. LGBT groups are motivated to cultural sub groups based on sexual orientation and paid to do public display of revolt towards traditional values and morals. Religion is deemed as devolutionary and highly toxic for the post-modern iPhone generation intellectual. In 1998 after two consecutive mandates by the Socialist-Democrats SDSM, the conservative right wing part VMRO-DPMNE won the parliamentary elections and constituted a government with an Albanian coalition party DPA. Back then as Minister for Economy was appointed Nikola Gruevski, a 29 year old economist, founder of the Macedonian Stock Exchange. Due to his economic reforms and successes in growing the economy, he was called the European wunderkind. The PM Ljubcho Georgievski initiated many cultural and infrastructural projects throughout the country. The combination of economic growth and high optimism for developing Macedonia, made the country troublesome to manage by the foreign diplomats. The government was being not as obedient and corrupt as the Socialist-Democrats and began growing the Macedonian national identity as the will of the Macedonian ethnic majority. Where diplomats and Soros don’t deliver, NATO does. In 2001 in order to topple the democratically elected conservative right wing party VMRO-DPMNE from its mandate, Macedonia was attacked first by a wiretapping scandal leaked by the opposition incriminating the ruling party and thus splitting Macedonians on political grounds. Then SDSM leader Branko Crvenkovski demanded the PM Georgievski to resign due to the implied incrimination in the recordings (then speculated obtained from British secret services stationed in Cyprus) and for a technical government to be formed to solve the political crisis. Then soon after Macedonia’s territorial integrity is attacked by organized terrorist insurgents from Kosovo, calling themselves as the National Liberation Army (UCK). NLA was consisted from ethnic Albanians from Kosovo but also various mercenaries of different backgrounds (so called dogs of war). NLA was trained and armed by the US army with local presence in Camp Bondsteel – Kosovo, as well as in various training camps and war fronts in the Middle East. These terrorists were labeled by all world media as Albanian freedom fighters and despite Macedonian military victory thanks to weapons bought from Ukraine, after 3,500 NATO troops were deployed to intervene, the political institutions capitalised and peace agreement was made in Ohrid that takes a large step towards federalization of Macedonia on ethnic grounds. In 2001 the head of UCK fighters in Macedonia was Ali Ahmeti, an Albanian from Kosovo with Swiss citizenship, who can’t speak a word of Macedonian. After the Macedonian political capitulation he created a new Albanian political party DUI and formed a government coalition together with the Soros funded SDSM (Social-Democrats) which leaked the wiretapping scandal right before the NLA insurgency. This officialized the terrorist attacks into a small civil war for greater human rights and rightful change of undemocratic and corrupt nationalist regime. Ali Ahmeti and his supporters changed their NLA uniforms for fancy suits and became politicians like Albanian party predecessor before him. A nation state that has lost its sovereignty and is being attacked on policy, grassroot and military levels becomes an “open society” vulnerable for further demographic engineering. In Macedonia this takes the form of population explosion of the Albanian minorities vs low natality of the Macedonian ethnic majority. The average increase of Albanians in Macedonia (2 million citizens) has been 100,000 people for every 10 years, which is combination from the high natality rate and large influx of immigrants from Kosovo settling in Macedonia. Larger and more concentrated a group gets, more institutional segregation is enforced through municipalities decentralization (the main achievement through the Ohrid Framework Agreemant). Basically if there are 51% Albanians in one municipality, the official language, toponyms and governance will be dominated by Albanian ethnic identity. What was supposed to be increase in quality of life for Albanians in North-West Macedonia, also became Ali Ahmeti’s career and source of significant wealth, status and power. He has access to national budget funds, international grants, loans, tenders for infrastructural projects and various forms of lucrative corruption and crime ventures. This means the Albanian political elite has direct interest to grow the Albanian population in Macedonia in order to occupy more real-estate and increase its wealth. This translates as more liberal acceptance of Kosovo immigrants. During the war in Serbia in 1999 350,000 refugees entered in Macedonia and unknown number stayed afterwards. This combined with steady migration of Ghegs from Kosovo and North Albania and natural increase in Albanian population through childbirth, the demographic structure in Macedonia is constantly changing for the past 25 years. This is how the West manages to create Albanian majority population zones on historically non Albanian and non-Muslim territories such as Kosovo and NW Macedonia. Once those people are there, they need to be integrated in the institutions and since they do not identify with the Macedonian state, the West expect the state to change, not for the minorities to assimilate or adapt. Albanians are two different ethnic groups, Tosks and Ghegs. Tosks are the more urban tradesmen, craftsmen, shop owners, with very adapted culture in multiethnic living in Macedonia, South Albania and North Greece for centuries (many are Catholics and Orthodox Christians). Tosks families are nuclear like the Macedonian and industrial mentality and way of living prevails (a child is considered a burden). Ghegs are mainly located in Kosovo and in North Albania and by features they are nomadic, agricultural (where children are blessing and useful resource), loyal and combative, with primary choice of religion being Islam. The Tosks dialect is the official literary language of Albania and Albanian literature and culture is excels the most from the Tosks. The population that grows rapidly with high natality are the Ghegs and they are the chosen partner for the US activities in the Balkans. This can be no accident if we look at history where it is recorded that since the 15th century the Ottoman Empire conquered the Tosk region of South Albania but never managed to subdue the tribal Ghegs of the north. Instead they were used a steady flow of mercenaries under the bayraktar act (bayraktars – banner chiefs). In their cultural and social code the Ghegs are very communal, traditional, and combative but very loyal serving to a boss. This is also one of the reason why the Albanian mafia is ranked in the top 5 in the world. Its members are mostly Ghegs. The American’s have chosen their ally on the Balkan very wisely. One has to notice if segregation on ethnic lines is natural, why so much money and effort is used to initiate it and where does it all lead? The common Albanian believes it all leads towards formation of Greater Albania, the ultimate ideal and goal an Albanian should have. What the Albanian public fails to realize is that they cannot have a large, strong and ethnically pure country called Greater Albania. 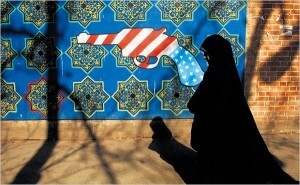 The Western interests in the region are not to integrate, but disintegrate. Albanian irredentistic and nationalist affinities are being used as a tool to generate conflict, political and economic instability where it suits Western interests. Simply put, divide and conquer. There is no greater evidence how failed this concept is, than current date Kosovo. A protectorate run by corrupt politicians with criminal backgrounds, failed institutions, poverty, mass emigration and most important of all an American military base that isn’t going nowhere. Despite this reality, the Albanian dream is placed as pink glasses on the normal citizen’s eyes. Bill Clinton’s statues are being erected. Disturbing and perverse to say the least. Edi Rama, the PM of Albania is a socialist and just like his electorate he is Christian (Albania has Catholics, Orthodox and Muslims). He only supports Great Albania as an ideological simulacrum for receiving approval and political influence in the region. A real Great Albania will be the end of Edi Rama rule in office considering all political parties in Kosovo and Macedonia are right wing, more or less, none are leftist. They only become less right wing, closer to the center when they are in rule. Nationalism in Albanian politics is cyclical. Every Albanian party (in Macedonia or Kosovo or Albania) in opposition is militant and nationalist as it appeals to the emotions of Albanian voters, which are demographically mostly young (under 35) and not as well educated as their keens in Western European countries. Any story of Greater Albania is merely romantic nationalism for effective political campaigns and fundraising throughout the Albanian diaspora. Obama should try it. The political floscule Greater Albania is something that simulates Albanian political unity, feeling of debt towards the US, serves as alibi to organize Islamic terrorist attacks to destabilize the region and hold a military presence (Camp Bondsteel). 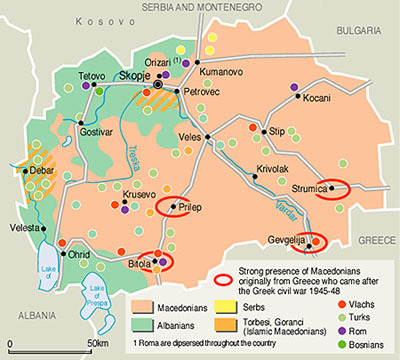 Albanian ethnic groups in Kosovo have no advanced military capability or political unity to wage war against Macedonia alone without horrendous defeat and losses, let alone against Macedonia, Serbia, Greece and Montenegro together. If US supports the project Great Albania, it risks all Orthodox Christian countries uniting under Russian umbrella, something that will mean eradicating all American influence from Eastern Europe. Too much money and time has been invested to lose it to fulfill some a teenage dreams. To put it bluntly there is no such thing as Greater Albania in any geopolitical concept. The US is no longer capable to create such intricate projects and manage them afterwards. All they are currently capable of is generating conflicts and wars, as it is much cheaper, or in other words, they run out of carrots. However, we should distinct generating conflict and creating a war. Macedonia is suspect to destabilization from ethnic conflicts and civil unrest but opening an all-out war is something everyone has realized as fatal for the whole region. A fire in Macedonia simply cannot be controlled and extinguished at will. The only way for the US to stop the spreading of BRICS capital and Russian influence in Macedonia is to repeat the same scenario that gave results in 2001. Vladimir Pandovski is the political and social analyst currently living in Macedonia. This is an excellent analysis and a great read. Perfectly explains the situation in the Balkans and Macedonia. Isn’t that what those that reference obvious Slavs as “ethnic Macedonians’ doing? Ethnic engineering like the Soviet Union once did. Will dishonestly pretending not to notice their recent identity change from Slavs into founders of the Hellenistic period and irredentism against Albania, Bulgaria and Greece for “United Macedonia” make it go away? Lectures on ethics by evading hypocrites that see only through one eye is hardly credible. I am a Macedonian, but also a Slav. Can’t see any hypocrisy in that. We have our language, our folklore, our culture. Even the architecture here is different to that in Bulgaria or Serbia for instance. We are in fact different, and have called ourselves Macedonians for quite some time now. But even if we take into account the fact that our state is only 65 years old, what gives other states the right to deny our existence?! Why is our very existence considered “irredentism” against anyone?! I know only of Greece and Israel that claim that their land “was given to them, as was their name since the beginning of time”, and both those claims are very doubtful (to say the least).